Lexus LX is no new brand as it has been in market since 1995. 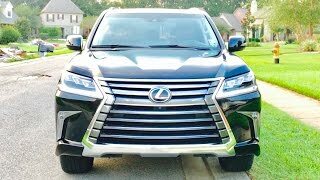 We recently saw the GS Sedan from the house of Lexus and soon after it, company took the curtains off its Lexus LX 570 2016. The model gets some new interior features, an upgraded exterior and a powerful engine to rule the hearts. 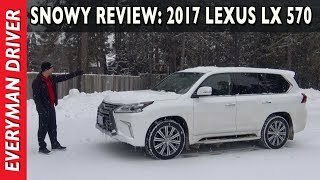 Let us have a look at the review of Lexus LX 570 2016 to know if the model really has the caliber to achieve milestone. The interior of Lexus LX 570 2016 is spacious enough for its eight passengers while the comfort and luxury remain uncompromised. Starting with the cabin where we have a massive 12.3 inch display controlled through a ‘mouse-like’ remote touch interface. The newly designed gauge cluster comprises of 4.2 inch multi-information display while the rear passengers get huge 11.6 inches screens as option. Adding to the list of option customers can also have a head-up display rather than going for individual screens. The cabin has been designed neat and so is the center stack. Getting to the spacious column, model features lots of legroom while the last row can be folded to add some extra space for the cargo. 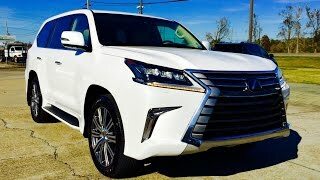 Thus rounding up the interior details of Lexus LX 570 2016 I would say the heated and ventilated seats with lots of space and technology will undoubtedly make the ride memorable. The exterior of Lexus LX 570 2016 gets rounds of upgrades, making it entirely different in comparison to model it replaces. Starting with the front fascia we have the massive spindle grille featuring lots of boldness with its new trim. On the either sides we have set of new headlights with integrated daytime running lights while the lower portion has set of fog lights. Moving towards the rear end you’ll notice redesigned set of 20-inch wheels while the rear portion gets L-shaped taillights and a split liftgate. 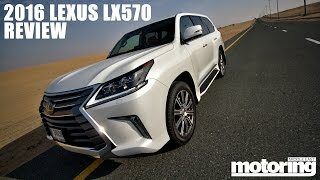 Comparing the entire exterior details of Lexus LX 570 2016 with the predecessor model, the model has been carved to feature more boldness, aggression and luxury. Powering the Lexus LX 570 2016 is a 5.7 liter V8 engine generating total output of 383 hp and peak torque of 546 nm mating to the all new eight-speed automatic transmission. The performance figures of Lexus LX 570 2016 are still not revealed but we expect to have them very soon.